I've made this cheesecake two ways: baking the sour cream topping (per the recipe below) and spreading it on once the cheesecake has chilled (as seen in the pictures above). I'm a fan of both methods, but the baked method will give you a cleaner cut when you slice the cake. 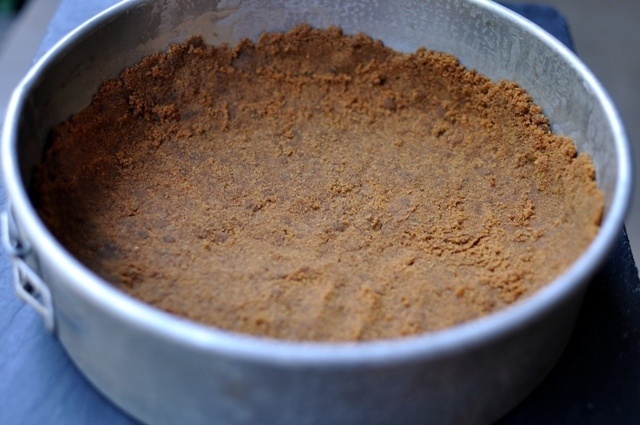 Make the Crust: Preheat oven to 325 degrees F. In a medium bowl, stir together cookie crumbs and cinnamon to blend. 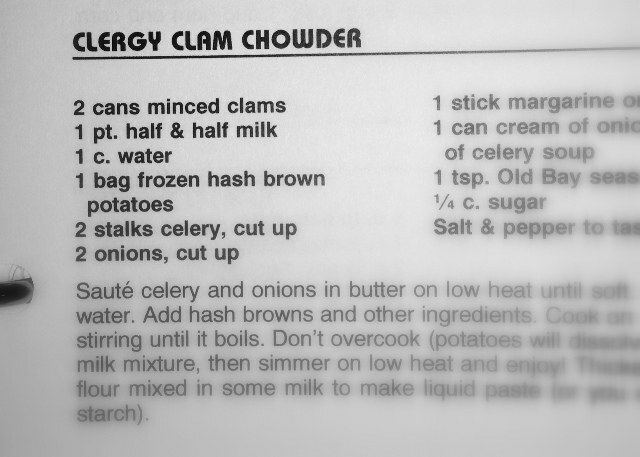 Add butter, stirring until crumbs are moistened. Invert the bottom of a 9-inch springform pan so the smooth side of the pan bottom is facing up (will make cake removal easier). Press the crumb mixture evenly onto the bottom and 1 inch up the sides of the pan. Bake until crust is set, approximately 10 minutes. Cool. Double-wrap the outside of the pan with heavy-duty foil and place in a large roasting pan. Make the Cheesecake: In a large bowl or the bowl of a stand mixer, beat the cream cheese and sugar until smooth. Add the flour and spices, mixing until smooth. Beat in the eggs one at time. Add the pumpkin, bourbon (if using) and vanilla. Pour cream cheese mixture into crust. Pour hot water into the roasting pan until it reaches 1 inch up the sides of the pan, being careful that it's not higher than the foil wrapping (or water will get inside and cause the crust to be soggy). Bake cheesecake in water bath until just set, approximately 1 hour 45 minutes. Whisk together the sour cream, sugar and vanilla in a bowl. Spread the sour cream mixture on top of the cheesecake and bake for an additional 5 minutes. Remove cheesecake from water and set aside to cool, approximately two hours. Remove foil. Run a sharp knife between cake and side of the pan. Chill the cheesecake until cold, then cover and chill overnight. Release pan sides and transfer cheesecake to platter. (At least an hour before serving the cheesecake) Make the Salted Caramel: In a medium saucepan, combine the sugar, water and corn syrup. Bring to a boil and cook over medium-high heat until a golden brown caramel forms, approximately 6-8 minutes. 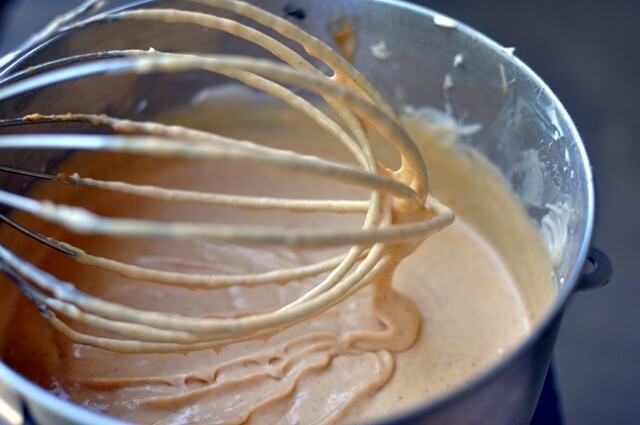 If you notice the syrup edges turning browner than the center, tilt the saucepan and gently swirl the caramel around. Keep close watch because the caramel can burn quickly. Remove the saucepan from the heat and carefully whisk in the cream, butter and salt. 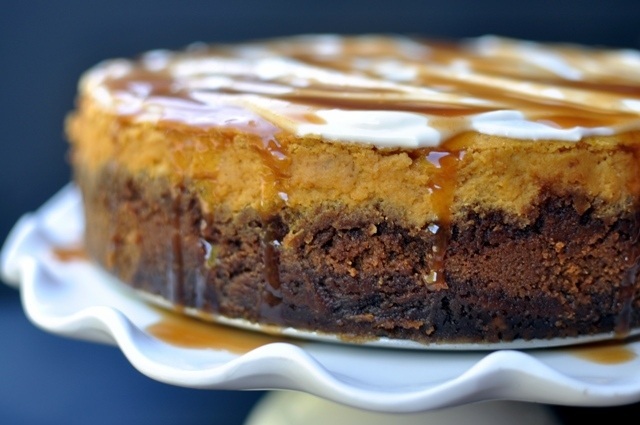 Let the caramel cool to room temperature. When the caramel has cooled, taste. Whisk in more salt if desired (1/4 teaspoon at a time). The caramel can be made up to two weeks in advance and stored, covered, in the refrigerator. Bring to room temperature before using. 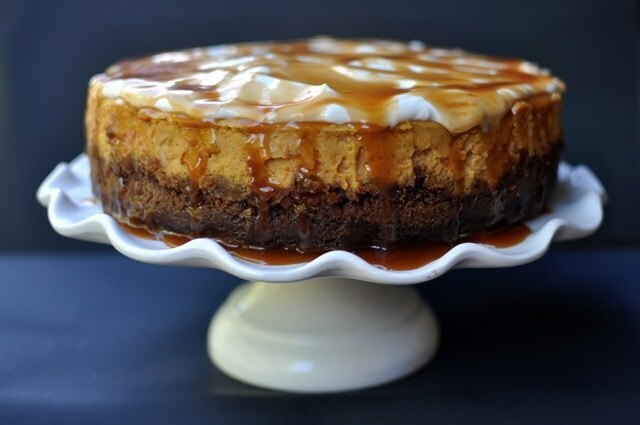 Assemble and Serve Cheesecake: Generously drizzle salted caramel on top of cheesecake. Cut the cheesecake into wedges. When serving, drizzle more caramel on the individual plates.